Evidently a Wendy's restaurant in Laredo, Texas (a city on the US-Mexican border) is now accepting pesos as well as US dollars in payment for their burgers. 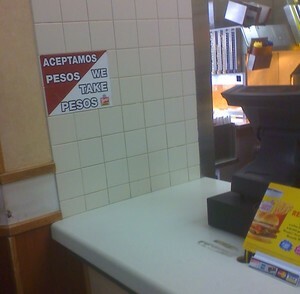 In this photo from examiner.com, you can see a sign the fast food restaurant posted, stating, "We Take Pesos / Aceptamos Pesos." Back in 2007, there was an uproar when Pizza Patron started accepting pesos for their pizzas. Will Wendy's suffer the same backlash? Is Wendy's promoting illegal immigration (as some charged Pizza Patron) or are they simply providing a service to their customers? Like many fast food chains, Wendy's has a Spanish version of their website. How would that be supporting illegal immigration. I think that the Wendy's is just providing a service for their customers. Not that I am a big fan of fast food but Wendy's should be able to take whatever foreign money they want.